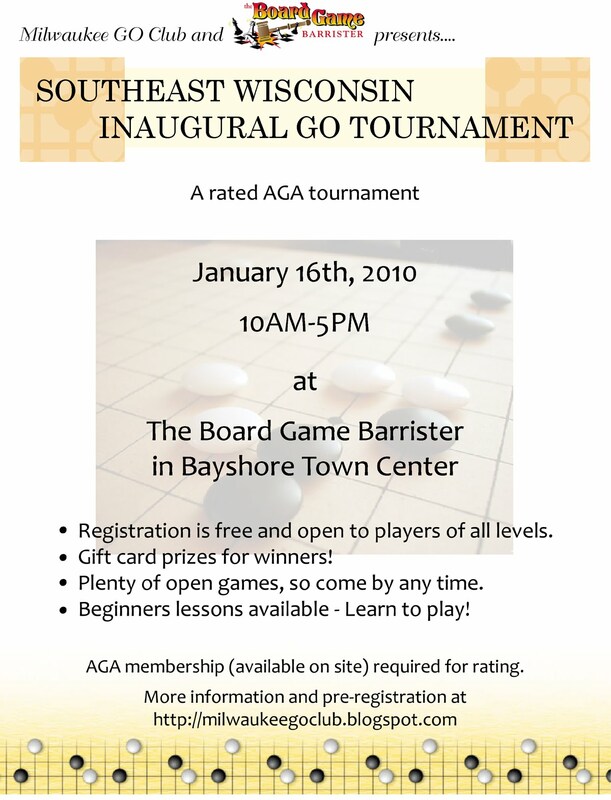 Southeast Wisconsin Inaugural GO Tournament, Jan 16th, 2010. Winners get gift certificates as prizes. Join anytime for open playing. Beginners lessons available for those who wish to learn how to play. If both players of a game are American Go Association (AGA) members, the game can be rated. This is a good opportunity for people around Milwaukee area who want to get ranked. AGA membership is available on the day of the tournament through Milwaukee GO Club. If you are planning to attend, please pre-register using Registration Form. We appreciate it although pre-registration is not required and walk-ins are welcome. Please bring your board and stones if you have one. Any question? Send us an email to the address found on the profile page!